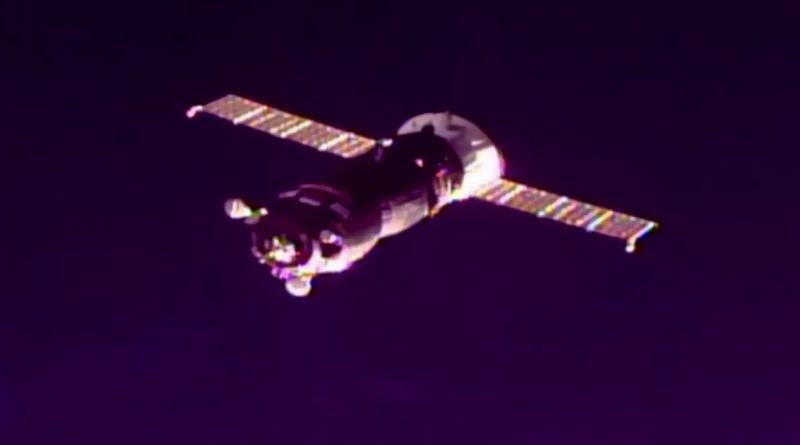 The Progress MS-07 resupply ship pulled into its orbital docking port at the International Space Station at 11:04 UTC on Monday after its commute to Station was extended to two days following a launch delay last week. Linking-up with the orbiting laboratory in textbook fashion, Progress MS-07 marks the final Russian supply run to ISS this year, delivering 2,549 Kilograms of food, fuel and supplies. Progress MS-07 lifted off from Site 31/6 of the Baikonur Cosmodrome at 8:46 UTC on Saturday, riding atop a Soyuz 2-1A rocket that provided it with a smooth boost into orbit. Separating from its carrier rocket after a nine-minute climb, Progress set out to take the scenic route after orbital geometry between itself and ISS had drifted apart as a result of the last-second ignition abort on Thursday when Progress was counting down toward a planned two-orbit, 3.5-hour rendezvous attempt. 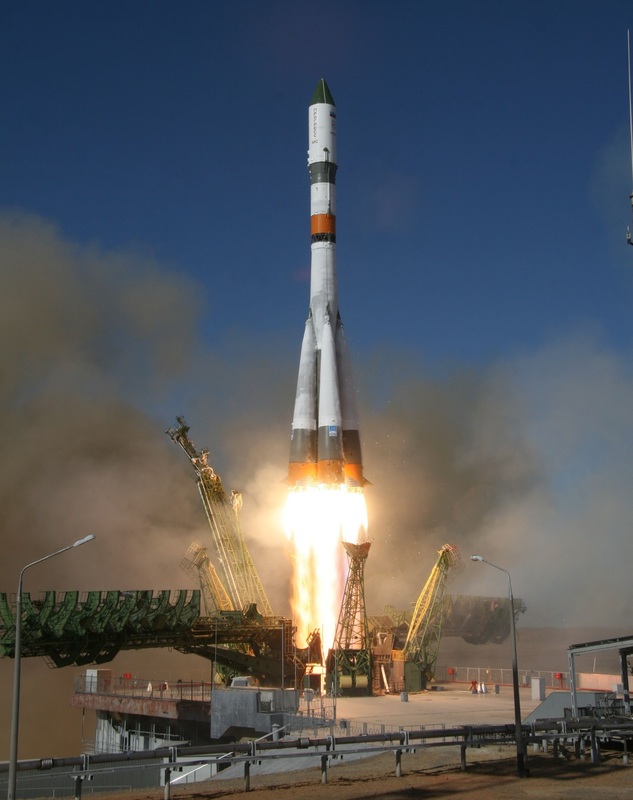 The new fast-track, two-orbit rendezvous scheme has been designed to further speed up the journey to the International Space Station for crews riding on the Soyuz spacecraft and cargo being ferried to Station on Progress. Presently, crews are dealing with an initial flight day that often lasts over 20 hours from waking up at the launch site, going through the multi-hour launch preparation process, flying a four-orbit rendezvous, and working through post-docking steps. Cutting the transit time to ISS by another two and a half hours is expected to increase overall crew comfort by getting them to their destination in space faster and cutting the time spent in the cramped quarters of the Soyuz. Russia has the major advantage of flying two very similar spacecraft for cargo and crew missions, allowing the Progress to act as a pathfinder whenever new technologies or flight techniques are introduced. Therefore, the new flight profile – relying on a combination of plane-change and phasing – will be tested out on the Progress before being introduced for crewed missions. With Soyuz encountering a last-second abort on Thursday – just before igniters would have fired in its engines, the two-orbit rendezvous plan had to be changed back to the traditional two-day flight scheme as the launch moved to its backup date. It will be up to a future Progress flight to demonstrate the new two-orbit rendezvous that is likely to enter operations for the crewed Soyuz once its missions shift to the modernized Soyuz 2-1A vehicle as precise orbit injection capability is highly desired to help in the setup of initial rendezvous conditions. The prime objective for the Progress MS-07 mission was the delivery of cargo to the Space Station, regardless of whether the delivery would take only three and a half hours or arrive after an extended rendezvous of 34 orbits. In total, the vehicle is loaded with 2,549 Kilograms of cargo, comprising 700kg of propellant to top up the Space Station’s tanks, 47kg of pressurized air and oxygen to replenish the Station’s atmosphere, 420kg of water for crew consumption and oxygen generation, and 1,382 Kilograms of dry cargo. The dry cargo loaded into the pressurized section of the Progress vehicle consists of the typical mix of food provisions (303kg), medical and hygiene supplies (197kg), crew protective and support equipment (104kg), various outfitting and maintenance hardware for the Russian segment (577kg), science payloads (38kg) and American cargo for the USOS and Russian crew members (165kg). Progress MS-07 is the heaviest Progress vehicle in recent memory, weighing 7,428 Kilograms at launch and carrying around 100kg more cargo upmass than its Progress MS predecessors. This was in part due to a change in the launch sequence that separated the launch shroud three minutes into the flight, instead of waiting until the third stage ignited, thus shedding additional weight earlier in flight and increasing the launch vehicle’s performance. 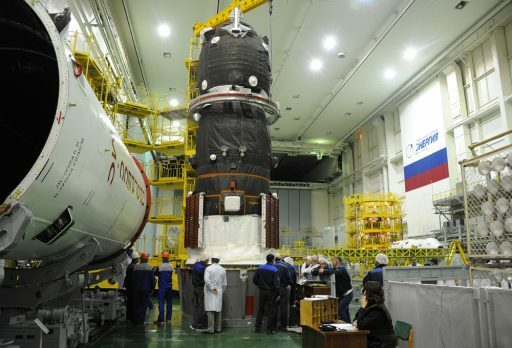 The earlier fairing jettison was part of a larger rehearsal of the launch procedure of a crewed Soyuz vehicle on the modernized Soyuz 2-1A rocket. Progress MS-07, production vehicle #437, is the 160th Progress mission in a program dating back to 1978 and the 68th Progress resupply mission to the International Space Station, the 70th counting two Progress M-SO and M-MM vehicles that delivered the Pirs and Poisk Mini-Research Modules to ISS. Departing Baikonur on Saturday, Progress MS-07 started out in an orbit of 192.9 by 241.2 Kilometers, inclined 51.67° – showcasing the accuracy of the Soyuz 2-1A launch vehicle & its digital flight control system as the target orbit parameters for the launch were set at 193 by 240 Kilometers. Immediately after its separation from the Soyuz booster eight minutes and 48 seconds after launch, Progress unfolded its power-generating solar arrays and went through an initial checkout of its flight control system. Heading off on its first lap around the planet, Progress entered three-axis stabilization and moved into a favorable orientation for power generation. Meanwhile, trajectory planners at Mission Control adjusted parameters for a pair of KTDU main engine burns on the vehicle’s third orbit. These maneuvers of the 300-Kilogram force main propulsion system lifted the Progress into a 304 by 336-Kilometer orbit, continuing to catch up with ISS from behind and below. On Sunday, Progress conducted a small correction maneuver to properly position itself for the initiation of the automated rendezvous sequence at 8:48 UTC on Monday. After rendezvous initiation, Progress executed its last ground-targeted KTDU burn that delivered the craft on a path into the 200-Kilometer communications zone around ISS where the relative navigation phase of the rendezvous began through activation of the KURS-NA system on the Progress and its counterpart on ISS. 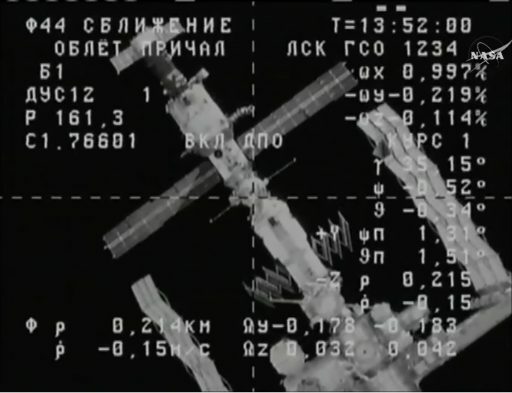 With KURS showing a stable lock onto the signals coming from ISS, Progress went through another large rendezvous burn ahead of a series of impulse maneuvers to enter the direct neighborhood of the Station. KURS data was verified at distances of 80 and 15 Kilometers and Russian crew members Sergey Ryazanskiy and Aleksandr Misurkin tested out the TORU system to ensure they had good control of the Progress in remote-controlled mode in case anything went wrong with the vehicle inside 400 meters. Progress MS-07 conducted two impulse maneuvers inside two Kilometers using KTDU and a third burn used the DPO thrusters to put on the brakes and set up the correct conditions for the flyaround. The Flyaround command was issued right at the 400-meter mark, setting the Progress on a 59-degree lap around ISS to line up with the Pirs Docking Compartment for a straight-up approach on the Station’s radial vector. Progress held very briefly when reaching alignment with Pirs before the crew was cleared to issue the final approach command to allow Progress to cover the last 200 meters to docking. The craft slowed down as it got closer and powered up its Docking Mechanism to be ready for contact with the DC-1 Module at a relative speed of 0.1 meter per second. 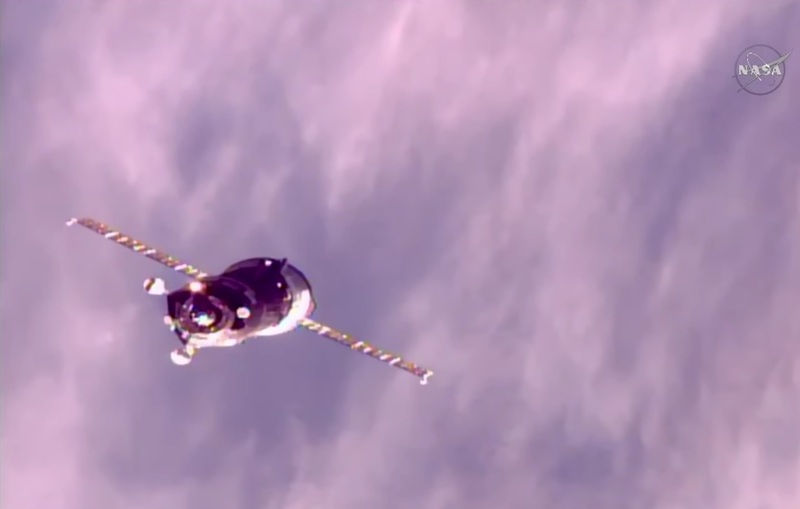 Contact and Capture was confirmed at 11:04:07 UTC as the Progress docking probe made contact with Pirs and the vehicle fired its translational thrusters to ensure capture latches would engage. At the same time, ISS entered Free Drift to allow relative motion to dampen out for Progress to close its hooks and latches to form a rigid structural interface before resuming active attitude control on ISS. 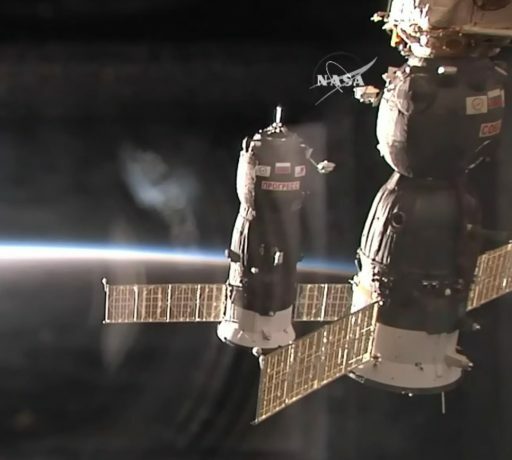 Having completed its rendezvous in textbook fashion, Progress was connected to ISS power systems and the Russian crew members put in motion the typical leak check procedure to set up for hatch opening later on Monday. Progress MS-07 is booked to stay on ISS for over half a year. The next Progress mission is currently penciled in for launch on February 13, 2018 – providing the next opportunity for a two-orbit rendezvous demonstration.